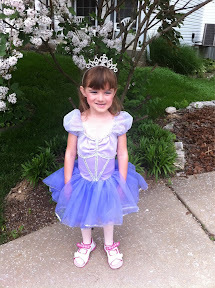 Today Alyce's dance class had picture day. It's not a dress rehearsal just getting individual and class pictures. Mom managed to grab a picture of Alyce before class. The outfit is just about as perfect as you can get for Alyce. Purple, check. Tiara, check. Fairy Wand, check. The recital runs over three performances and Alyce's is June 11th. Sadly we won't be seeing all the girls. The teacher is splitting them up so there can be representation at each recital for her age group. I'm ok with it as it will give Alyce more time in the spotlight. My fear is that with so few classmates (3 others) on stage and an auditorium full of people that Alyce will get some stage fright. I'm hoping that the dress rehearsal before the show will allay those fears. 0 comments on "Dance Class Picture Day"